CENTREVILLE, VA (September 6, 2017) - The National Elevator Industry, Inc. (NEII) announced several new hires and promotions as it completes a major restructuring to become more effective industry advocates across the code, regulatory and legislative arenas. NEII promotes safety, innovation and performance in the building transportation industry throughout North America and is now well-positioned to drive that mission. With the NEII staff now in place, the building transportation industry has strengthened its position advocating for responsible public policy that promotes safe and consistent standards. The additional staff members deepen the organization's reach and ability to be the definitive voice of the industry. Since 1989, Penafiel has worked with the Building Owners Managers Association (BOMA) International, most recently as the Vice President of Advocacy, Codes and Standards. During her tenure, her focus was to establish BOMA as the premier commercial real estate association on legislative, regulatory and codes issues. In her 26 years at BOMA, she has held several positions within the advocacy division. In 2008, Penafiel was promoted to Vice President, Advocacy with Codes and Standards added to her role in 2012. Penafiel graduated from Hamilton College with a Bachelor's Degree in Government. Kevin L. Brinkman has been promoted to vice president of codes and safety. 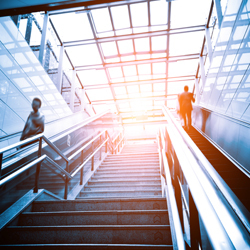 Brinkman will continue to lead the industry to develop and adopt effective and consistent model elevator and escalator codes that protect the safety of workers and the riding public. Brinkman joined the NEII team two years ago as a consultant. Brinkman has been in the elevator and lift industry for almost 27 years. He previously served as the Vice President of Engineering for both the National Wheel-O-Vator Co. and ThyssenKrupp Access. In addition, he was the president and founder of Kevin L Brinkman & Associates, a consulting firm providing engineering support to elevator and lift companies. Amy J. Blankenbiller has been promoted to vice president of government affairs. Blankenbiller will oversee the expanding Government Affairs team and is responsible for leading the association's legislative and regulatory efforts to advance safety and reliability. Blankenbiller joined NEII as a government affairs consultant in 2010. Formerly, Blankenbiller was the president and founder of AJB Strategies, LLC, a consulting firm working with associations, organizations and private businesses to implement government policy strategies, and President and CEO of the Kansas Chamber of Commerce. To add to the advocacy fire power, Dylan Isenberg joined the team as NEII's new director of government affairs. Isenberg came to NEII from the Building Owners and Managers Association International, where he worked for two years as the association's advocacy manager. Earlier in his career, Isenberg worked in the office of U.S. Senator Sheldon Whitehouse (D-RI). The newest addition to the team is Nicole Van Velzen, director of communications. Van Velzen will lead NEII's efforts to communicate the safety, reliability and technology advancements underway throughout the industry. Her vast experience includes marketing and copy writing for a variety of clients as owner of Larkspur Coordinations; marketing director for the Boys & Girls Club of Lawrence (KS); and public affairs director for the Kansas Chamber of Commerce and Industry. Megan Hensley rounds out the team and provides research support to the codes and safety, government affairs and communications efforts as the association's project manager. Hensley draws from a diverse background in education, coaching and event planning to serve as a strong team member, helping NEII and its staff operate most efficiently and effectively. "For the past few decades, NEII has been a highly regarded industry advocate â€“ with just a handful of consultants and no full-time employees. Over the past year, we have grown to a staff of six with over 90 years of combined experience in the areas of advocacy, codes development, and association management expertise," says Karen Penafiel, executive director, National Elevator Industry, Inc. "We are excited to see what our new team will accomplish as we continue working to advance elevator and escalator safety across the country." The National Elevator Industry, Inc. (NEII) is the premier association representing the global leaders in the building transportation industry. Its members install, maintain, and/or manufacture elevators, escalators, and other related products. NEII promotes safe building transportation for new and existing products and technologies, and works with various organizations on the formation, adoption and enforcement of the latest building transportation codes and standards. NEII membership includes the major elevator companies in the United States, if not the world. For more information about NEII, please visit www.neii.org.